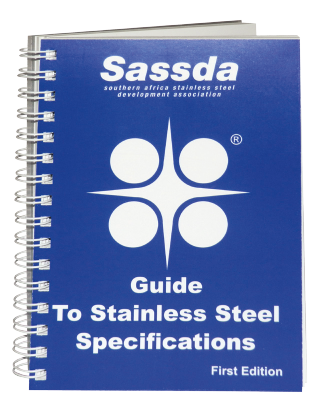 Sassda’s GUIDE TO STAINLESS STEEL SPECIFICATIONS has been developed as a quick and easy-to-use stainless steel reference source, which will be of interest and assistance to engineers, designers and materials specifiers in South African industry. The Guide lists all ASTM and EN stainless steel specifications, arranged by product type. The relevant tables from the 25 most important of these standards are reproduced in full. In addition, there is an Equivalence Table which links the ASTM types (AISI and UNS) with the EN types (name and number). The Guide also contains a stainless steel grade index which allows easy reference to the applicable specifications, using all the naming conventions including AISI, UNS, ACI, EN, etc. The guide is available to registered Sassda members for R650.00 and R950.00 for non-members, including VAT.